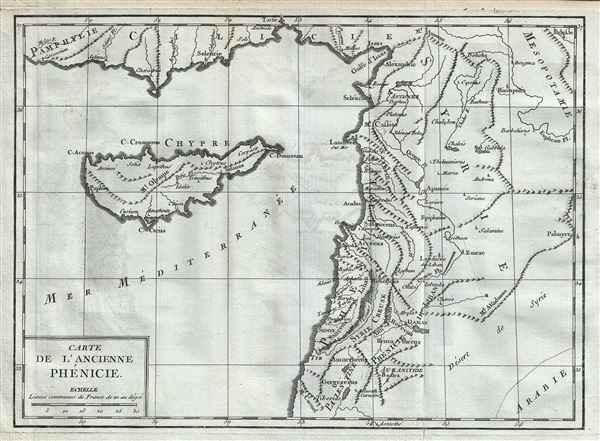 This is a scarce 1782 map of Phoenicia or modern day Cyprus, Lebanon, Syria and Israel or Palestine (Holy Land) by Jean- Baptiste-Claude Delisle de Sales. The map covers from southern Turkey to Palestine and inland as far as Mesopotamia. Several important ancient cities are identified with their ancient names. The map also notes rivers, lakes and other topographical features, with mountains rendered in profile. Phoenicia, according to some scholars, was an ancient civilization along the eastern coast of the Mediterranean. Believed to be of Semitic origin, the Phoenicians (or Canaanites, as they might have called themselves), most likely appeared in the region about 3000 BC. They were notable maritime merchants and traders who colonized most of the Mediterranean Coast by the late eight century. This map identifies some of the important Phoenician cities and colonies including Tyre (Tyr) and Sidon, among others. The Phoenician phonetic alphabet, known to be the root the modern alphabet can be attributed to the Phoenicians.